Two in Solitude: Ombre, Balayage and Dip-Dye: I coloured my hair! Ombre, Balayage and Dip-Dye: I coloured my hair! In mid-January I walked into a salon and coloured my hair for the first time. I had been dreaming of the day for so long, and had been growing my hair for the past 2 years in preparation for the big day. I don't exactly recall who it was I saw that inspired this sudden yet lingering urge to colour my hair. What I had dreamed of, was a dip-dye. But the terms are not always clear. Dip dye, ombre, balayage. And google images isn't the best at differentiating them either. After being confused for a long time between whether I wanted ombre or dip dye, I settled on dip dye. It looked a lot easier to maintain and I figure if I don't like it anymore I can just get a pair of scissors and hack away. From left to right, the styles are dip-dye, ombre and balayage. 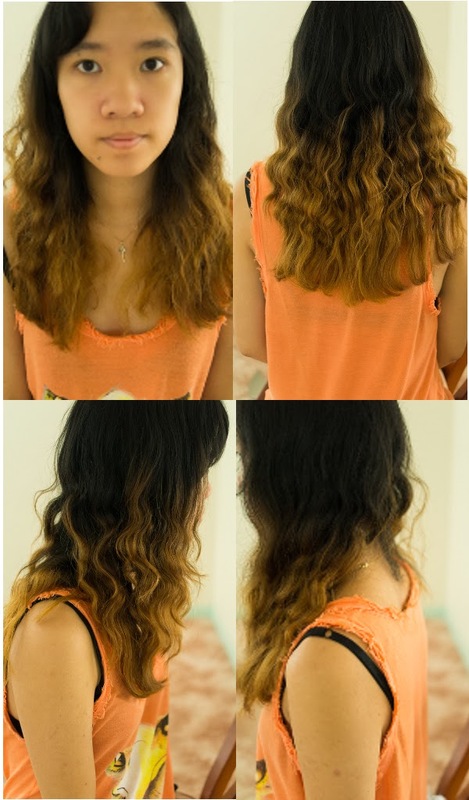 Dip-dye is pretty much exactly what it sounds like, and has a more dramatic effect. Ombre is a gradient of dark to light hair from root to tip. Balayage is a little different from both of them - it is a more 'natural' look and aims to give the hair that sun-kissed effect, and instead of using foils when dying it is done by hand. My hair ended up a bit of everything I guess - it's not quite a dip dye, it's not quite an ombre and it's not quite a balayage. I was originally hoping to dip bye my hair a blonde so I could go crazy with colours and wash-out dye. But in the end, I went for a light copper because my stylist was worried my hair would not go very light, since it's jet black. I was also concerned about the state of my hair if I were to go so light so fast. I also really liked the look of the copper when she showed me a giant board full of colours. The whole process took about 2.5 hours - first she went through and added what looked like a bright blue paste to my hair. She teased it a little before applying it to ensure it didn't end up choppy. Then I waited about 20mins as the dye slowly lightened my hair. Then it was washed off, a toner was added and my hair was shampooed, trimmed ever so slightly and curled. The end result was amazing! I am so happy with my hair and so glad I decided to go through with it. My first time colouring my hair was a great success! !